Mobile app marketing is an important form of marketing for mobile applications, or apps found in app stores on smartphones, desktops, and all mobile devices. WormWood SEO, as a leader in the web site optimization industry, is one of the first to offer marketing for mobile apps. We have developed a process that is considered white hat, to bring your mobile app to the forefront of potential shoppers and clients. Mobile App search optimization is the process of improving the volume or quality of traffic to an app from app stores such as android and iOS apple store, iTunes and search engines via “natural” (“organic” or “algorithmic”) search results. Typically, the earlier a site appears in the search results list, the more visitors it will receive from the app store and other search engines. 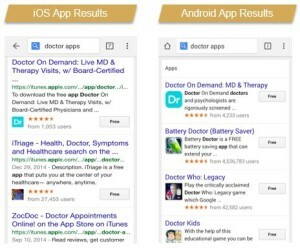 The organic marketing may target different kinds of search keywords on Google Play, Apple Store, iTunes and also traditional search sites such as Google, Yahoo! and Bing. This gives a mobile application, a proper web presence. As an application or app marketing strategy, SEO considers both how traditional search engines and app marketplaces work and what people are searching for. Optimizing a mobile application primarily involves editing its content and it’s related reference web site’s HTML coding to both increase its relevance to specific keywords. Ranking in the Apple Store, Android and Google Play is currently focused on two core areas. The keyword alignment and app performance are critical. Reviews, ratings, and performance of the app download all are ranking factors. Additionally, just like traditional search marketing, links and external citations now matter. This form of optimization is referenced in the industry as ASO. The important factors to the on app controls that are available are titles, description and device or platform keywords. To build a successful marketing experience for mobile applications, we use a combined effort of ASO, or on app optimization and traditional SEO creating citations, references and links to the app, as well as a traditional web site promoting the mobile app. To start promoting your mobile app through mobile app marketing or ASO, give us a call at 425-369-7565. We are known in the industry for achieving results and unyielding focus to details. ©2013-2017 Designed by WormWood SEO.